Paris is perfect for a lover’s walk among the squares. A patchwork of dozens of shapes are put together into the Jardin des Tuileries. 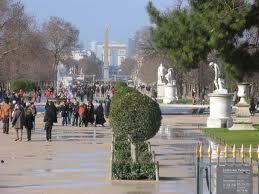 The Parisians made their tile out of clay soil and tile factories stood where the Palais des Tuileries rose. Much of the garden still displays a tile-like break up with square courtyards and formed paths. At least 3,000 chairs dot the paths of the gardens. You may to bring an umbrella to block the light, or protect from raindrops on dreary days. The lawns are strewn with sculptures by known artists – from Rodin, The Kiss, Eve, Meditation and The Great Shadow and works by Max Ernst. There are two ponds where birds may bother to sit and children drop their coins. There is a circular promenade where paths converge. You can come across just about any stroller on this demure garden. The paths are outlined by trimmed trees in different shapes. The garden opened in 1664, laid out by Andre Le Notre. You may find a corner to have a bottle of wine and cheese while you rest on the lap of another. All paths arrive at the Eiffel Tower, built in 1889. Built of iron, the lattice tower took two years to make. Like a needle sticking out of the sky, its shape is different from any other tower. Its openness may be its most ornate attribute. Any person can see through its gaps from up in the air and receive the wind from the city. Its insurmountable height, 10,000 feet, begins with an arched open area below, where you can look up at its height and realize how small you are compared to this great iron reproduction. The bridges of the Seine River are a sight. Many arches are supported by balustrades with embroidered flourishes. Leaves form unique decorations. On the sides of the river, giant rings still hang that used to tie boats to the shore. Staircases lead up to the street. The river winds through Paris. There are 32 bridges along the water. The river, curving and moving brings a history together. The 761 ft. Pont Neuf bridge has a total of 12 arches and was opened in 1607. It was the first bridge with pavements making it a meeting place. The Pont Des Arts bridge is located near the Louvre and it is a nine-arch metallic footbridge. Adorned with thousands of locks from past lovers, you can visit the bridge and put your lock up on the railing. It is a place to encapsulate your love and leave a mark on Paris’ history. Paris is the city of lights and if you are with your lover these lights are even brighter. Enjoy the amazing sight of the Eiffel Tower lit up so that its entwined structure sparkles in the dark evening; walk the way of the Seine River and watch the street lamps reflect off the water; or trod that Jardin des Tuileries during a wonderful day and share your umbrella with the one you admire to keep the sunlight away from your faces.